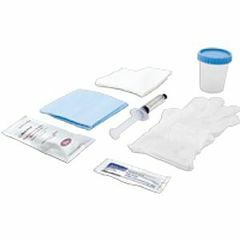 The Foley Catheter Insertion Tray comes complete with 3 swabsticks, a fenestrated drape, a water proof under buttocks towel, 5cc of lubricating jelly, two vinyl gloves, a 1000ml collection tray and a 10cc or 30cc pre-filled sterile-water syringe. The tray is packed sterile and recommended for single use. This catheterization tray can save you time and money. It is designed to have all the necessary components packaged in one user friendly system. By opening one simple tray you have all the products needed for catheterization. The catheter is not included so you can choose the proper size and type thus reducing the tray inventory needed.